Overnight is when our skin can do its best work – your muscles are relaxed, and there aren’t any toxins around that you face on a regular basis, like makeup residue, air pollution, greasy foods and more. Here are some of the best Soy of Life products to help heal your skin while you sleep. Our Soyweet Dreams! rejuvenating facial cream works to renew and repair your skin while you sleep with an ultra-hydrating and rejuvenating formula. It’s a great choice for dry, normal and mature skin, and the range of active ingredients – including peptides, green tea, chamomile and other essential oils – will restore youthful softness, improve overall tone and elasticity, and restore moisture for smooth and younger looking skin. This product will keep signs of aging at bay, and can also help reduce the signs of rosacea. For those delicate under-eye areas, try our Eye Promise! all-in-one perfecting crème to reduce dark circles and puffiness. If you’ve ever noticed your skin looking dark and puffy in the morning, even if you had a full night’s rest, this product is for you. Cooling cucumber and peptides will reduce circles and reduce skin swelling, while skin-firming proteins smooth fine lines and wrinkles and improve your skin’s elasticity. Hydrate and nourish the area under your eyes with this incredible crème! Another option for under-eye care is our Soy Young! under eye therapy, specially formulated to reduce fine lines and wrinkles. You’ll wake up with nourished skin in the morning, after the combination of age-defying essential oils, rejuvenating plant oils and antioxidants work their magic on your skin while you work on catching some Z’s. The Grace Your Face! renewing 2-in-1 cleanser and toner is exactly what you need to refresh, renew and revive tired-looking skin. Apply this product before bed, and while you sleep, aloe and an herbal blend, enriched with vitamins and antioxidants will rejuvenate your skin. Wake up with smoother, tighter and refreshed skin with improved clarity and tone. You can also use this product as a makeup remover or gentle cleanser. It’ll remove the day’s makeup and residual oil without removing moisture from your skin. Our About Face Toner & Spritzer is loaded with good-for-your-skin ingredients to help fight the signs of aging. Spray this toner on before bed, and powerful antioxidants that boost healthy cell function, improve skin’s radiance, and minimize enlarged pores will leave you with plumped, tightened and youthful-looking skin when you wake up. The whole line of skin care products from Soy of Life is made using all natural ingredients and, of course, soy. 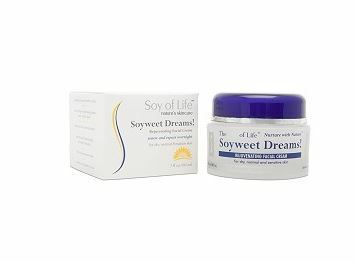 Learn more about the full selection of Soy of Life products and place an order today right from our website. For help with your order or to learn more about any product, call us today at 877-SOY-FOR-U. ← Enjoy the Luck of the Irish with Our St. Pat’s Sale!